A party of friends was celebrating Saturday as a limousine rolled along a highway in rural Schoharie, New York, about 30 miles west of Albany. By the time authorities had dug through the wreckage, the full extent of the disaster was clear: 20 people were killed. Initial reports said 18 of those victims had been passengers in the limo. Although the accident took place shortly before 2 p.m. Saturday, details remained sparse on Sunday. The New York State Police had not released the names of any victims, pending notification of of their relatives. 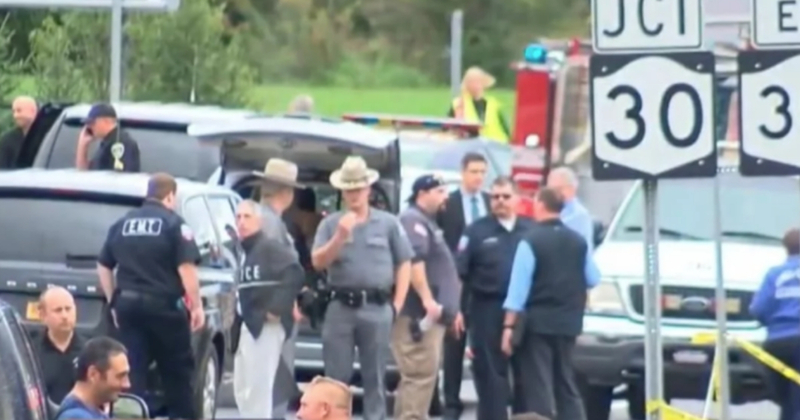 What’s known is that the limo came down a hill at the intersection of Route 30 and Route 30A and plowed full speed into a crowd of bystanders at the Apple Barrel Country Store, the Albany Times-Union reported. “We’ve had three tractor-trailer type vehicles — they come down that hill too fast, they go though our parking lot and they end up in a field behind our business,” she said. Both people and cars were hit by the SUV-style stretch limo. It was not revealed how many people were injured or how many cars were damaged. Bridey Finnagen, who lives nearby, described the scene of the crash to WTEN. “I saw a lot of people here at the Apple Barrel out in the parking lot. Then I heard screaming. Then I saw this large van, a very unusual looking vehicle out here in Scoharie in the bushes and really wrecked, hit a tree,” Finnagen said. The Times reported that brothers Rich and Axel Steenburg and Axel Steenburg’s wife, Amy, died in the crash, attributing the information to Lester Andrews, 60, of Rochester, N.Y. The Times quoted Andrews, who was identified as the stepfather of the Steenburg brothers, as saying that Axel and Amy Steenburg, who were married this summer and lived in Amsterdam, N.Y., had rented the limo. The Apple Barrel Country Store posted a short note about the “horrific accident in front of our business today” on its Facebook page. “First, we want to thank all of the emergency services that responded. We are so thankful for all of you. Our hearts grieve for the victim’s families, our customers who tried to help, and our staff who did everything they could to comfort,” the store posted. The store noted that it would be open Sunday, with one change from its usual way of doing business. “We will be collecting donations for our local volunteer emergency services. They are the heroes of our small community. Our hearts and prayers go out to everyone that was affected by the events of today. You will always be part of our family,” it posted. The National Transportation Safety Board was sending a team to the crash site.